Rosemary Glass features original designs in the medium of borosoilicate (pyrex) glass. A self-instructed artist, Rosemary Pierro has spent seven years applying the concepts of shaping molten glass to the creation of Hawaiiana-themed collectibles. 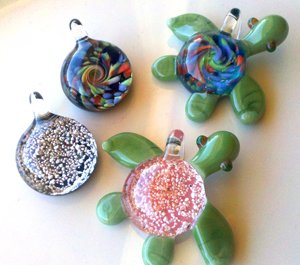 Whether pendant or ornament; the sea turtle, gecko, starfish, and dragonfly are favorites in this growing collection. By incorporating beach sand into most finished pieces, this product is unique to Kaua'i. Created in the Wainiha valley.